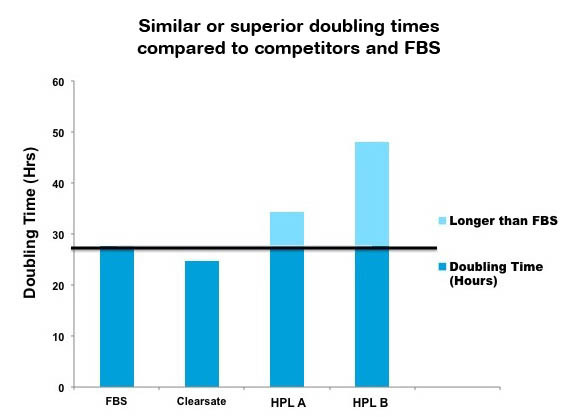 Human platelet lysate contains high concentrations of growth factors and cytokines that can support the growth and maintenance of a variety of cell types, including stem cells, lineage committed progenitor cells, normal somatic and malignant cell lines. The use of non-human growth supplements risks the introduction of animal viruses and proteins that can trigger immune and allergic responses and utilizing human-derived supplements avoids these risks. 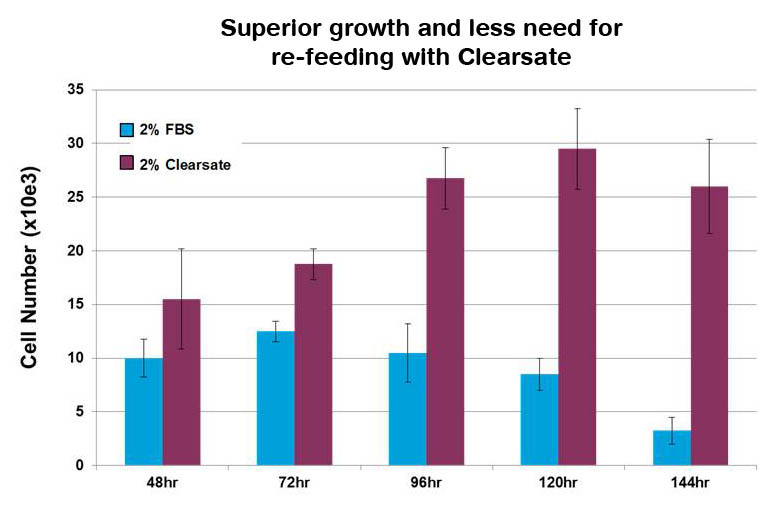 Clearsate is a potent, high quality platelet lysate product developed by the San Diego Blood Bank as a human media supplement alternative to fetal bovine serum (FBS) or AB serum for cell expansion applications. 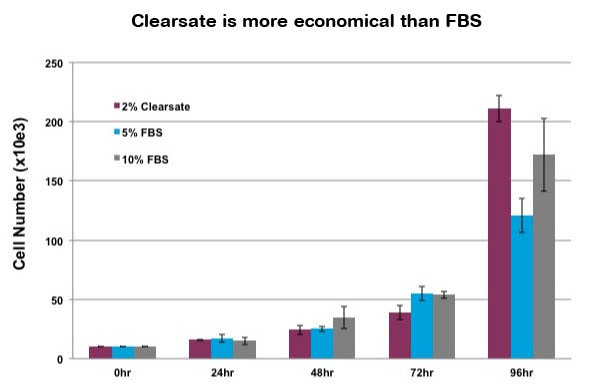 Extensive preclinical studies with a variety of cell lines were carried out to optimize the potency of Clearsate as a media supplement that is superior to FBS and other competitor’s products. 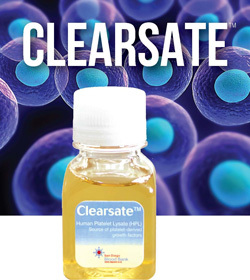 Clearsate is produced under cGMP guidelines from the platelets of healthy screened human blood donors and is fully tested and negative for various viral and bacterial contaminants including West Nile virus, HBsAg, AntiHIV1, HIV2 and Syphilis pathogens. 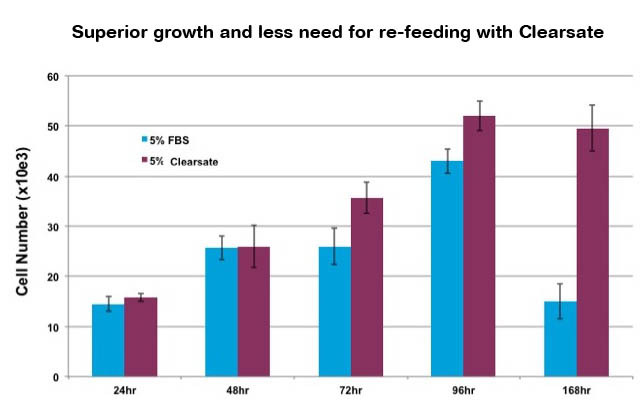 In summary, Clearsate human platelet lysate product is an effective media supplement alternative that San Diego Blood Bank is pleased to offer to researchers and cell therapy manufacturers for growth and maintenance of a variety of mammalian cell types.